Here's my belated Tintin. Trying something different again with this one. 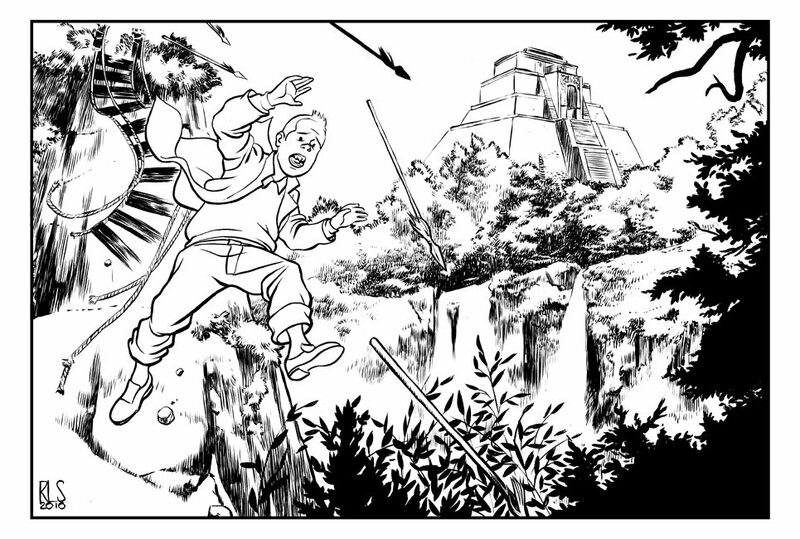 One thing I like about Tintin is that there are instances where you have this cartoonish character in an immersive, fairly realistic background and that's what I kind of tried to do here. Looking back, I probably should have treated the background a lot more simply and not spent time on all the hatching and such. I just got carried away. I love it. That background is fantastic. Your rendering of the rocks and the leaves are fascinating. It reminds me a bit of what Sean Murphy is doing right now in Joe the Barbarian. Oh man, that background makes me sickly jealous of yr mad skillz, Ron! The negative space waterfalls are absolutely beautiful. Agreeing with the guys here, that background is wild, Ron. It really reinforces the idea you're talking about here. Richard Pace reinforced what I was thinking in that I went overboard with the rendering of the background. So I was thinking to do one of two things: 1) render Tintin in the same kind of way that I rendered the backgroun or 2) erase the waterfalls, background foliage, and pyramid and re-do it in a much simpler line style. What do you guys think of either option? Honestly, and I don't mean this to give you less work. I think it works. People are often too scared of juxtaposition in illustration. I think it makes things pop and makes the scene more alive as is. "This combination allows readers to mask themselves in a character and safely enter a sensually stimulating world. One set of lines to see. Another set of lines to be." Great treatment on the bg. Well, thanks guys. You've effectively changed my mind about this piece. I'm glad it works. Nathan - I don't want to bother you with this since I'm sure you're busy with actual work. I might throw some colour on this at some point.